I had dinner with my family at Oriental Pavilion last Sunday night. We ordered the siu yoke, soon hock fish, crispy roasted chicken, braised broccoli with mushroom and fish maw, stir-fried ostrich with ginger and spring onions and the Cantonese beef kuay teow. The siu yoke was as good as I remembered. The succulent pieces of porky delights were oh-so-tender with fats that melt in the mouth. I think only my siblings and I enjoyed it, as my parents don’t fancy fatty pork meat. o_0 I thought the roasted chicken was pretty tasty. The meat was juicy and the skin was crispy – one bite and it crackles. It was tasty enough on its own so I didn’t bother dipping it in the sauce provided. The steamed soon hock fish was not bad. I reckon this was one of the better fishes I’ve had…and it came with a HEFTY price tag. A portion of this cost RM252! Price aside, the flesh was very smooth with a glossy, pearl-like colour. Lightly flavoured with soy-sauce and ginger stripes, this cooking method cleverly enhanced the already sweet and tender flesh of the soon hock. 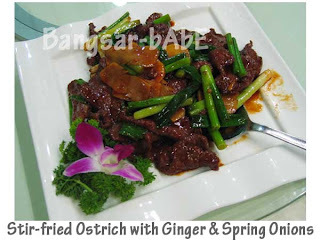 The stir-fried ostrich with ginger and spring onion was also quite tasty. 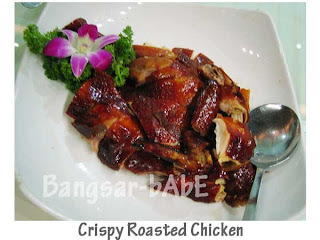 The meat was very tender and coated with fragrant gravy; thanks to the generous amount of Chinese cooking wine added. 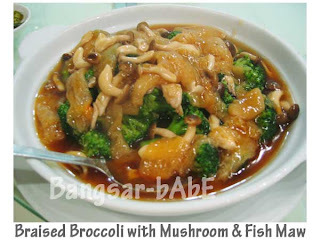 While my sister enjoyed the braised broccoli with mushroom and fish maw, I wasn’t particularly impressed with it. I felt that it was slightly on the starchy side and it was rather bland tasting. The mushrooms were however, juicy and big in size. The beef wat tan hor (Cantonese beef kuay teow) is my favourite dish in Oriental Pavilion, with the siu yoke coming in a close second. As usual, the noodles were delicious with that distinct ‘wok hei’ and the beef was delightfully tender. So good that my sister, who doesn’t fancy wat tan hor insists on having this dish again. All in, dinner was satisfactory and service was up to par. Not sure exactly how much each dish cost but the bill came up to RM 430 for 6 of us inclusive of service charge and tax. Verdict: Nice place to have family dinners. The food is pretty good in general. looks like you went for a TYPICAL chinese new year dinner type of food, with the sui yoke and the steam fish, the only difference is that its “slightly” fancier. 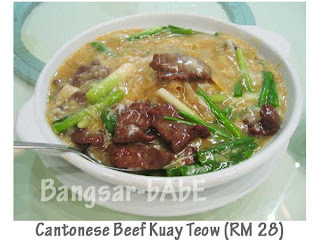 seems like there is less beef in the cantonese beef kuay teow. good roast chicken and tender ostrich meat is hard to come by seems like 2 thumbs up? or am i wrong? the soon hock is over priced wor..200plus for what appears to be half a fish only?..the siew yuk looks good enuf to go for though..